More so than last week in Navan, this felt like a new dawn for Kildare football. Not much champagne football around on a baltic afternoon in St. Conleth’s Park. No 14-second goals to rip the heart out of brittle opposition. This was the real thing and Kildare’s raw young team had to engage brain and heart to find the path to victory against promotion favourites Cork. Find it they did. Eventually Kildare were comfortable enough six points winners, but it could have been so different. Let’s be honest, normally it would be different. The modern-day Kildare narrative meant that a sinking feeling enveloped the old ground when Luke Connolly’s controversial 55th minute goal brought Cork to within a goal of the home side. When Cork won the next kick out and Barry O’Driscoll narrowed the gap to two it looked depressingly ominous. But something is stirring in Kildare blood this spring. Just as Meath’s comeback was swiftly repelled last week, so Kildare found it within themselves to face their own doubts head on against one of the country’s better teams. Unexpected leaders emerged and Kildare kicked on to put (let’s be charitable) unhelpful refereeing decisions behind them and march on towards a fully-deserved six point victory to make it two wins out of two. Before Connolly’s goal, which referee Cormac Reilly allowed to stand despite Ian Maguire taking up squatters rights in front of Mark Donnellan in the Kildare square (did someone mention Benny Coulter? ), Kildare had seen a goal of the season contender ruled out when Reilly belatedly heard linesman Maurice Deegan whispering Valentine’s Day sweet nothings in his earpiece. In Deegan’s eyes Daniel Flynn had double-hopped while charging towards the Cork goal from 45 metres out before finishing with aplomb past Ryan Price in the Cork goal. 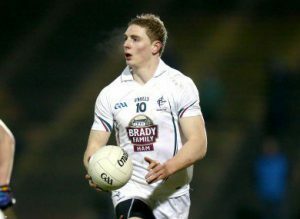 That would have put Kildare six clear in the 43rd minute but they picked themselves up again and talented sharp-shooter Ben McCormack smashed home the second goal of his nascient senior career to put daylight between the teams seven minutes later. Within another few minutes McCormack could have put the game to bed with a second goal but Tom Clancy rescued Cork with a goal-line clearance with Price beaten. Cork went straight up the other end and Connolly’s long range effort sailed over Donnellan’s head to put the game in the melting pot. It was Kildare’s first goal conceded this season. Other than O’Driscoll’s point, Cork though didn’t score again until injury time as Kildare upped the ante with Neil Flynn finding his shooting boots after a difficult start to the year while defensively the likes of Eoin Doyle and David Hyland put Cork’s attackers in a vice-like grip down the home stretch. On the coldest afternoon I can remember in St. Conleth’s, the breeze favoured Kildare at least to some degree in the first half. In truth, rather than blowing directly into the town goal, the icy drizzle was blowing somewhere in the direction of Whitewater, where any sane local folk were ensconced. Cork looked the more likely in the opening minutes although both teams struggled to breach the opposition wall spread across across half-way. With Niall Kelly tightly marked by James Loughrey and Paul Cribbin struggling to impose himself on the occasion, it was Kevin Feely who did most of the prompting for the home side. Indeed he must have felt he was back playing centre-back in soccer as he shuffled balls left and right to his “full backs” on the wings. Kildare have a different tool in their armoury these days and they drew Flynn back into the midfield area to use his pace in an attempt to pierce the red wall. He opened the scoring inside two minutes when Feely sent him through on goal and Price tipped his goal-bound shot over the cross-bar. Thanks to Deegan’s later intervention it would be Flynn’s only score. Cork took 40 minutes to score from play. Connolly and Colm O’Neill had them 0-2 to 0-1 ahead from frees by the 10th minute but after that Kildare took control. McCormack has qualities that are quite foreign to the traditional Kildare forward. Twice he found a yard of space and didn’t have to be asked twice before raising white flags to encourage the home crowd. The superb Feely then ventured forward a couple of times to score two points of his own as Kildare took command and Neil Flynn slotted two first half frees. Cork’s only retort before the break was a Connolly free on 28 minutes but the hard-working Cribbin put a frustrating half behind him with his first score in injury time. Kildare were five ahead, 0-8 to 0-3, but it could have been more only for six first-half wides. Fergal Conway was having a bad day at the office from that perspective and the jury is still debating his positioning on the half-forward line. That’s not to say he shouldn’t be in the 15. The Rebels sent John O’Rourke into the fray at half time and they started purposefully after the break. Paul Kerrigan finally got them off the mark from play on 40 minutes and another household name Aidan Walsh burst through the cover to grab another two minutes later. Cork were within three. Nervousness around the place. Then came the controversy with Deegan’s intervention. With Flynn’s score chalked out, Kildare were struggling to get their scoring machine working again. Thankfully Tommy Moolick shrugged off a dead leg incurred at the start of the half and despite being off-balance swung over a close range point with his weaker left foot. McCormack’s goal put daylight between them but Tomas Clancy ventured forward to bring it back to six points and then Connolly’s goal punished McCormack’s failure to add a second goal when he did everything right in pulling Cribbin’s wayward shot out of the sky and shooting towards goal but Tom Clancy’s clearance kept Cork in touch. Connolly’s goal and O’Driscoll’s quick-fire point made it 1-9 to 1-7 and if you were a betting man or woman (which Kildare person isn’t?) your money was only going one way. From that point on though Kildare players seemed to take it in turns to take the game to Cork. Hyland and Doyle locked up the back door, the tackling ferocity levels increased and the likes of Ollie Lyons, Keith Cribbin and Johnny Byrne took advantage of a tiring Cork to carry the ball towards the Kilcullen end with pace and menace. There were some question marks in supporter circles over Neil Flynn’s place in the team but when the chips were down he came to the fore. A free out of his hands on 58 minutes stretched the lead to three and a minute later he swivelled to shoot a fine long range effort over the bar. With three minutes left on the clock the Maynooth youngster made it three on the spin with another point from play. Cork were five behind now. Still the crowd didn’t relax as memories of Tyrone and Down are too raw. But Kildare are maturing. Captain Doyle executed a perfect block to prevent a certain Cork point and as the game entered injury time both Feely and the elder Cribbin took black cards as the whites shut up shop. All Cork could muster was a Connolly free to get within 4 points before Cribbin the younger rounded off a workaholic performance with his second point and Chris Healy then notched the first senior inter-county point of his career with a close-range free. Next up are Derry in two weeks time. While the availability of the under-21 panellists, chief among them being rising star McCormack, is doubtful with their championship starting 3 days later, you’d have to feel optimistic that this winning run can continue, particularly in light of the Oakleafers’ fifteen point humiliation in Navan today. Whisper it but something’s stirring. For line-ups and scorers see here.